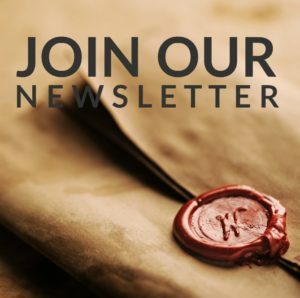 Outlander Updates: News on Fraser's Ridge, Diana Gabaldon & More! 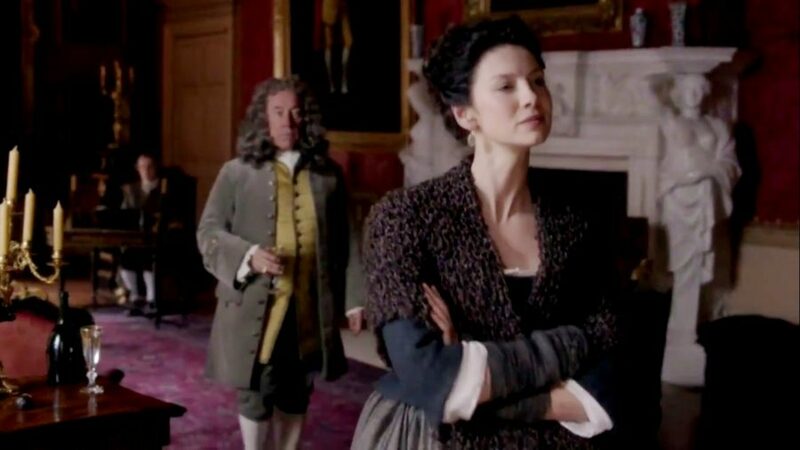 Need your Outlander fix during Droughtlander as we await Outlander Season 5? 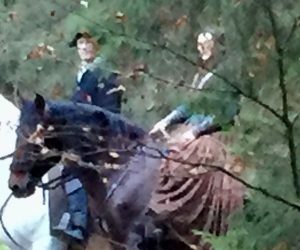 We’ve got Outlander updates on what’s happening to Fraser’s Ridge, new Outlander tour sites and more. 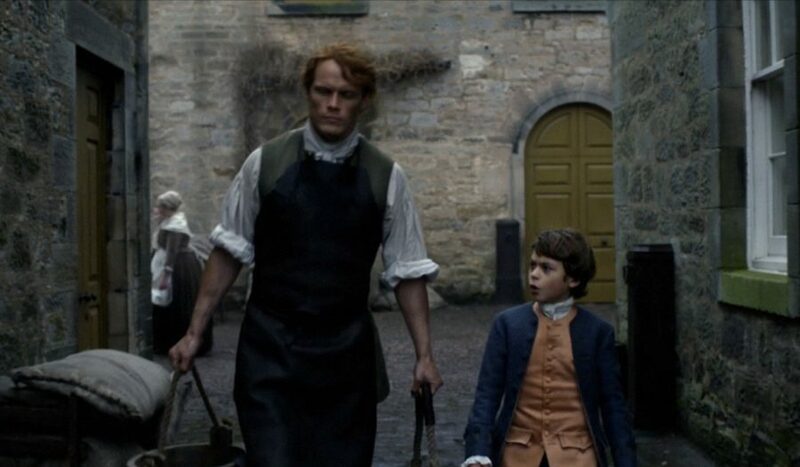 Even though #Droughtlander has set in, we can still enjoy some of Outlandish goings-on. 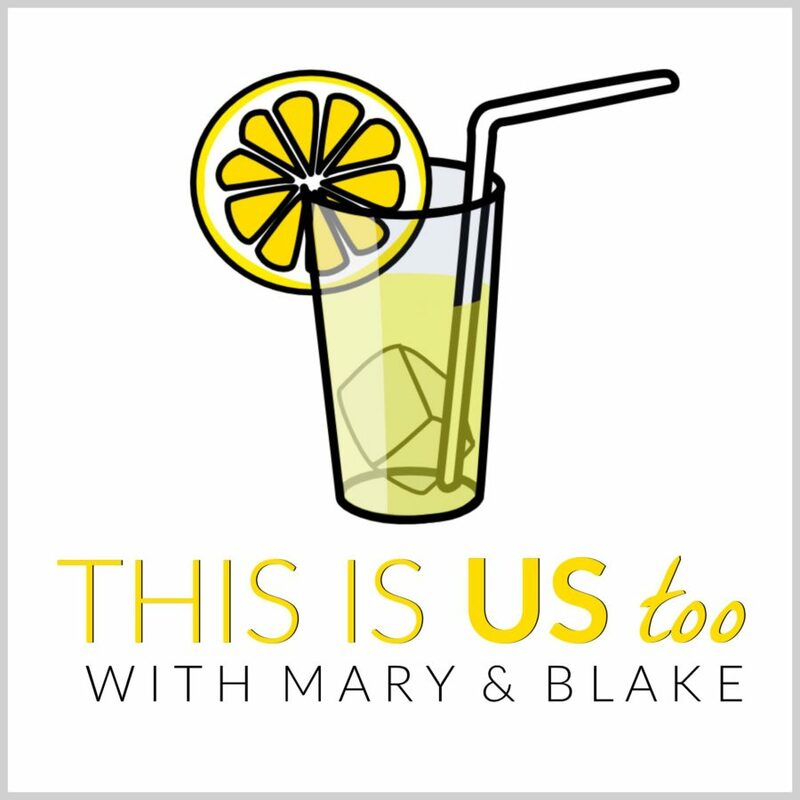 Here are a few little somethings to tide us over — with a little help from my friends. 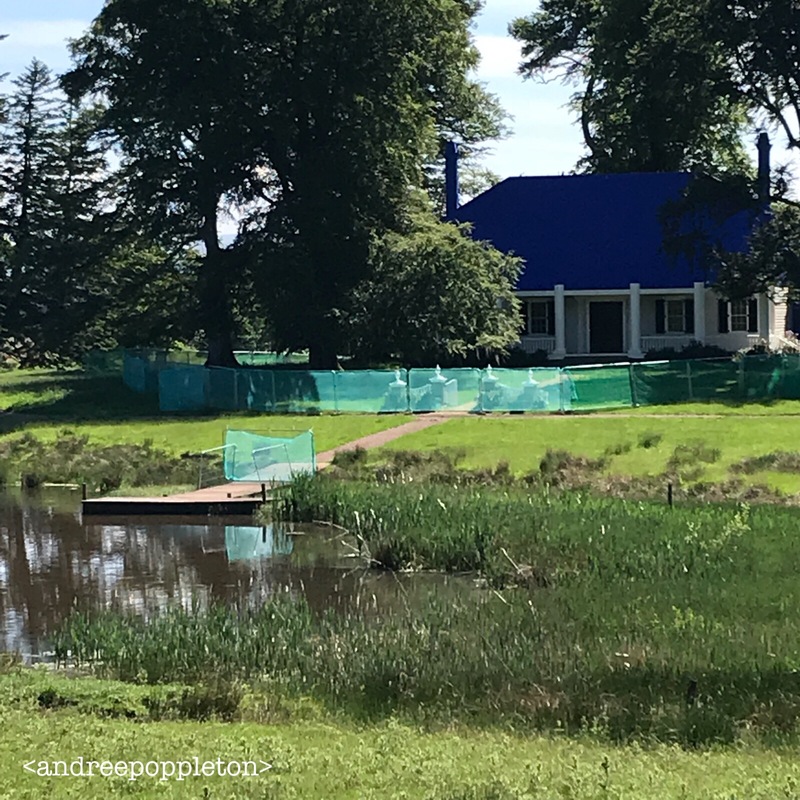 While Outlander fans everywhere were anxiously awaiting the announcement that Outlander Season 5 has finally started filming, keen fans on the ground in Scotland took to scouting around to see what’s afoot. At Fraser’s Ridge, Claire and Jamie’s Outlander Season 4 cabin got an outer coating to face the rigors of the Scottish winter. 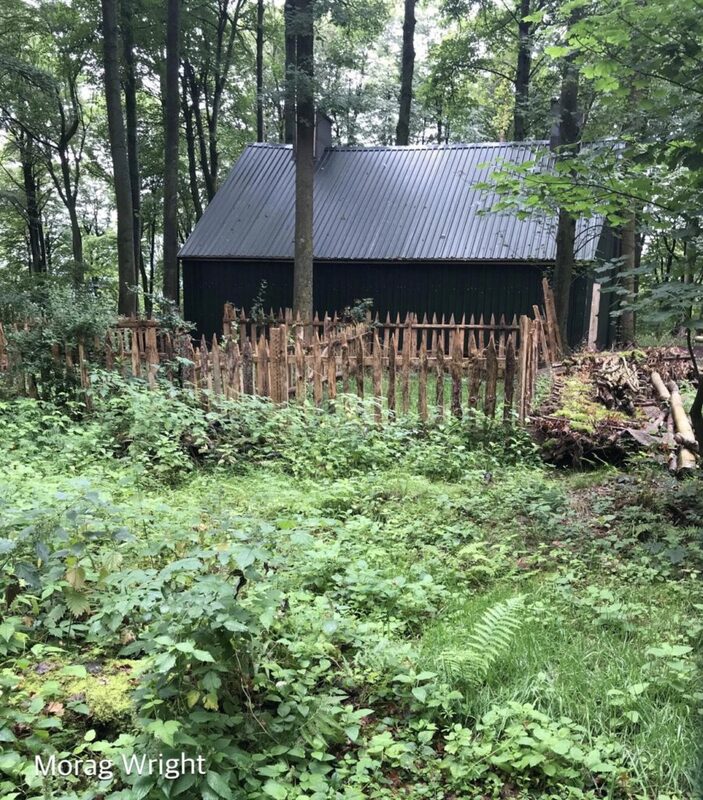 But now, the covers are off and the cabin looks ready again to be used as a location. 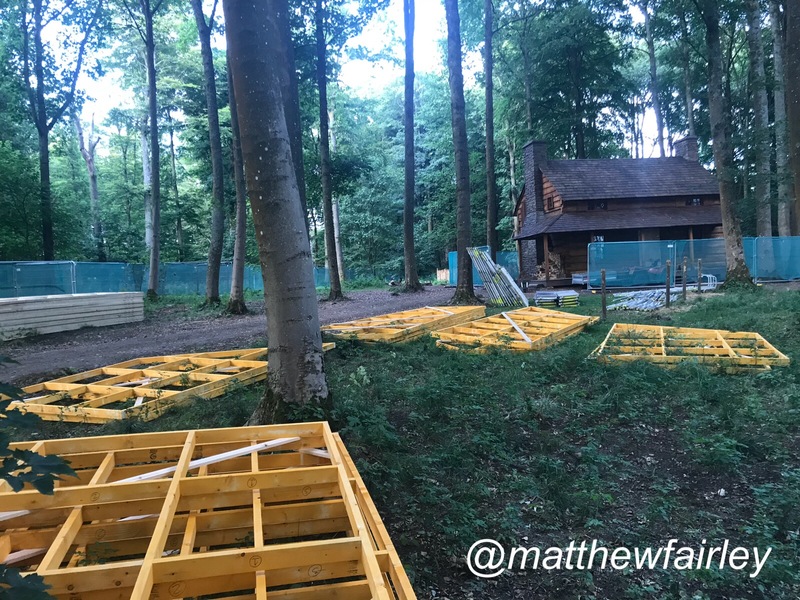 As of last weekend, the covers are off and the cabin is ready for action. At “Wilmington” new building works have taken place, and the town has been expanded. 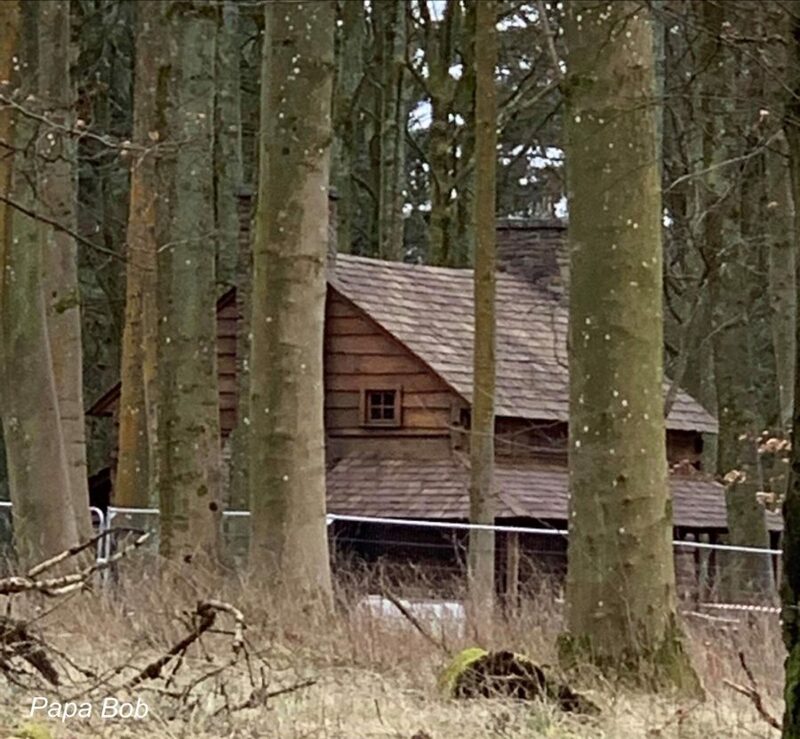 Looks as if they will have a couple of new streets and buildings to use for different townscapes in Outlander Season 5. Also, River Run was looking pretty sparse on a frosty winter morning compared to her summer look. No intel on the location of the Big House yet. The suspense! Hunterston House in Ayrshire is now open for tours. You might remember that I visited there some time ago and wrote a post about it. At that stage tours were not available and I made special arrangements with the owner. But now, you can arrange private tours for a minimum of 4 people at a very reasonable £20 per person. 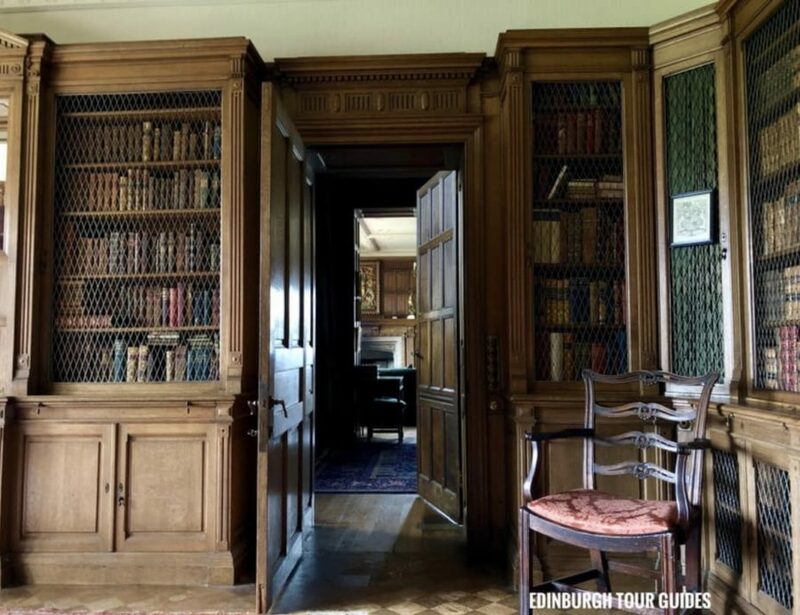 Sam Thomson of Edinburgh Tour Guides went there recently and shared these pictures. 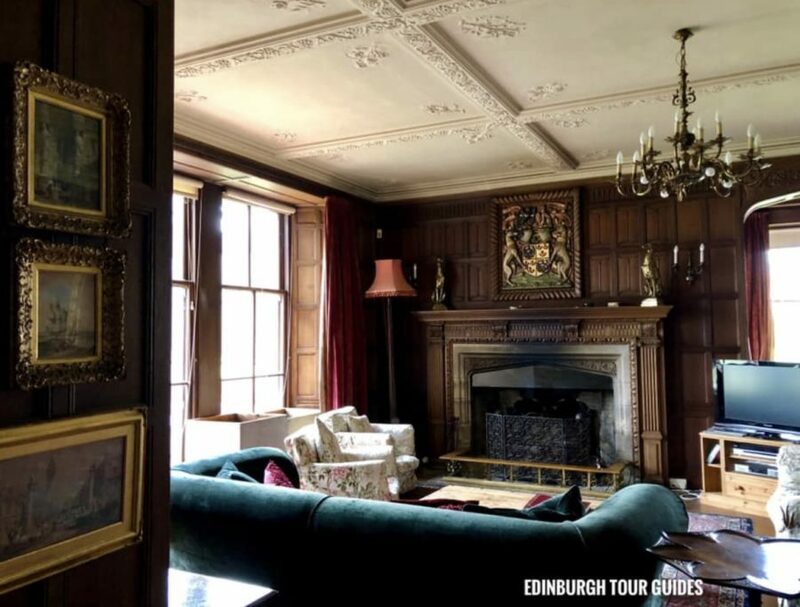 If you want to look back at my post you can see pictures showing which scenes were filmed in the various rooms of Hunterston House. 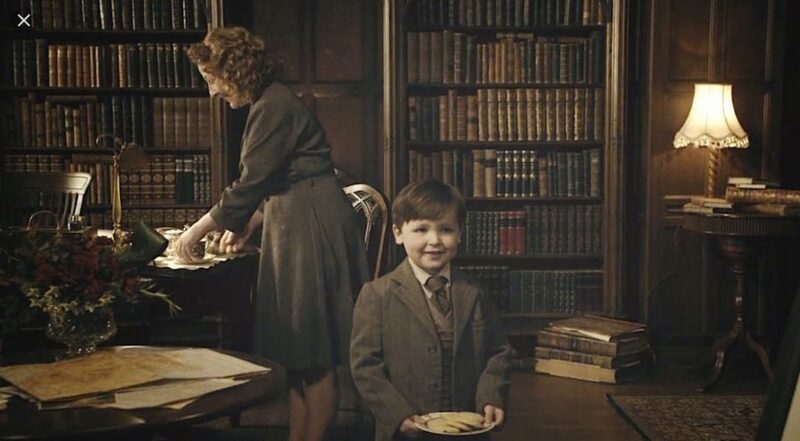 Wee Roger hoping for a biscuit in the library of Hunterston House aka the Rev. Wakefield’s house. 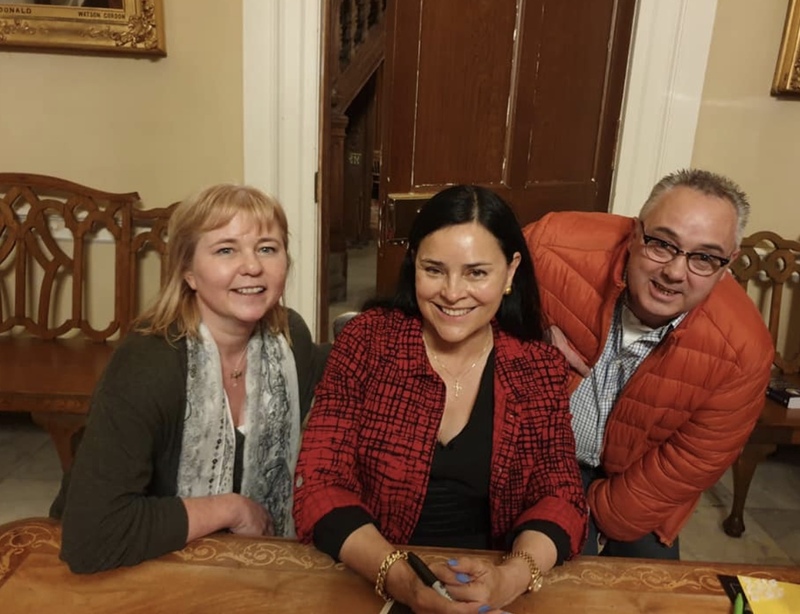 By now everyone knows that Diana Gabaldon has been gallivanting around Scotland basking in the glory of receiving a Thistle Award from Visit Scotland, the Scottish Tourism authority. 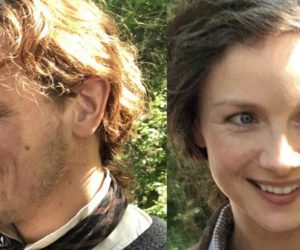 The “Outlander Effect” is going strong. 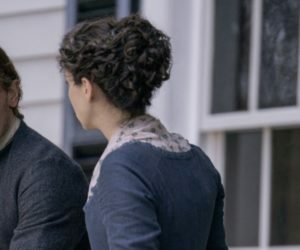 While it was a thing before the TV show started, it has blossomed and burgeoned with the advent of Outlander, the TV series. Tourism to Outlander filming sites is flourishing, with a corresponding impact on the Scottish economy. The award presented to Diana was a spectacular work of art. 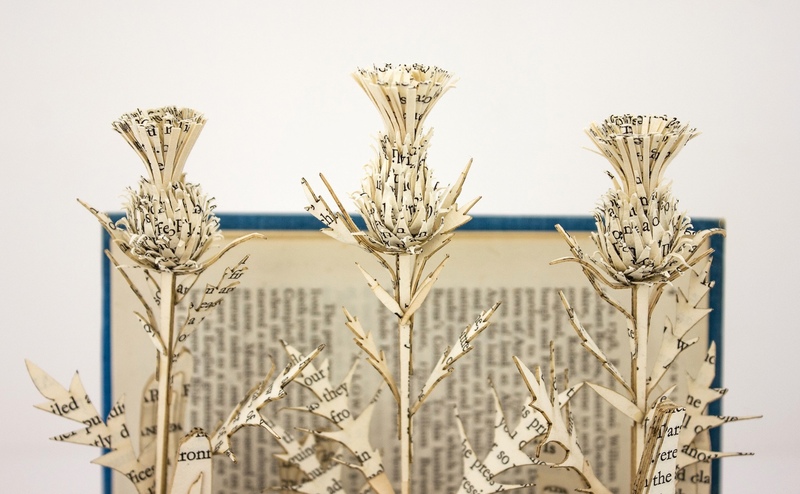 For those who haven’t seen, it here it is, commissioned by Visit Scotland and created by Scottish book sculptor, Thomas Wightman. 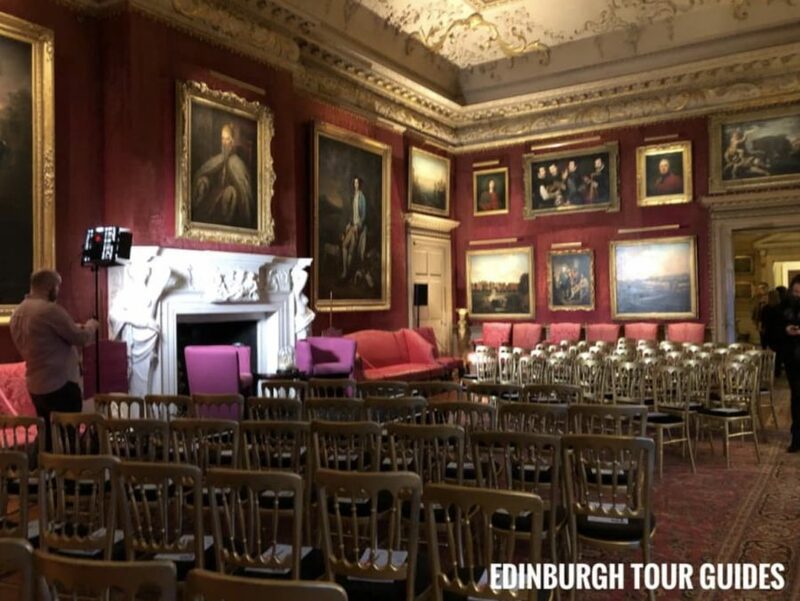 While in Scotland Diana held an intimate gathering at Hopetoun House – one of those very well known Outlander locations. 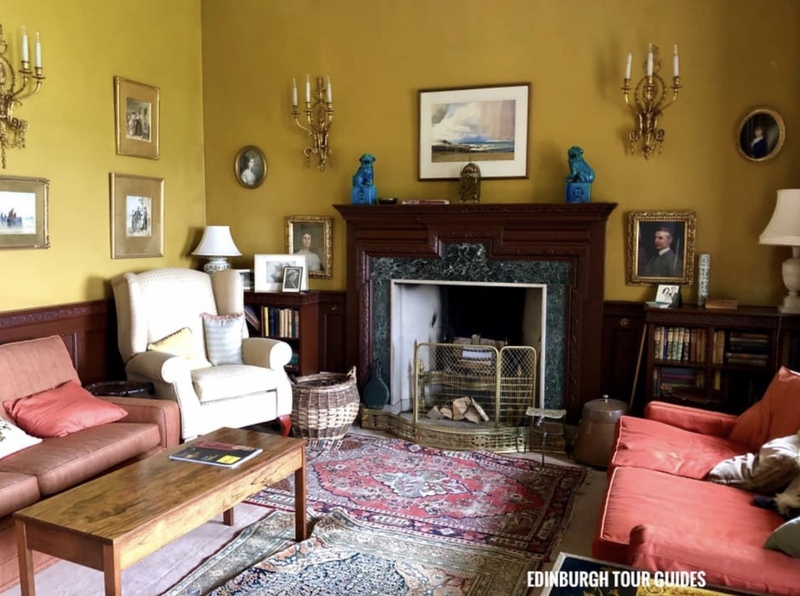 Hopetoun House is a stately home on a magnificent estate which includes Midhope Castle (Lallybroch) and is very close to Blackness Castle (Fort William). In case you’re interested, here’s the link to a post I wrote some time ago outlining a plan to visit these closely situated sites. 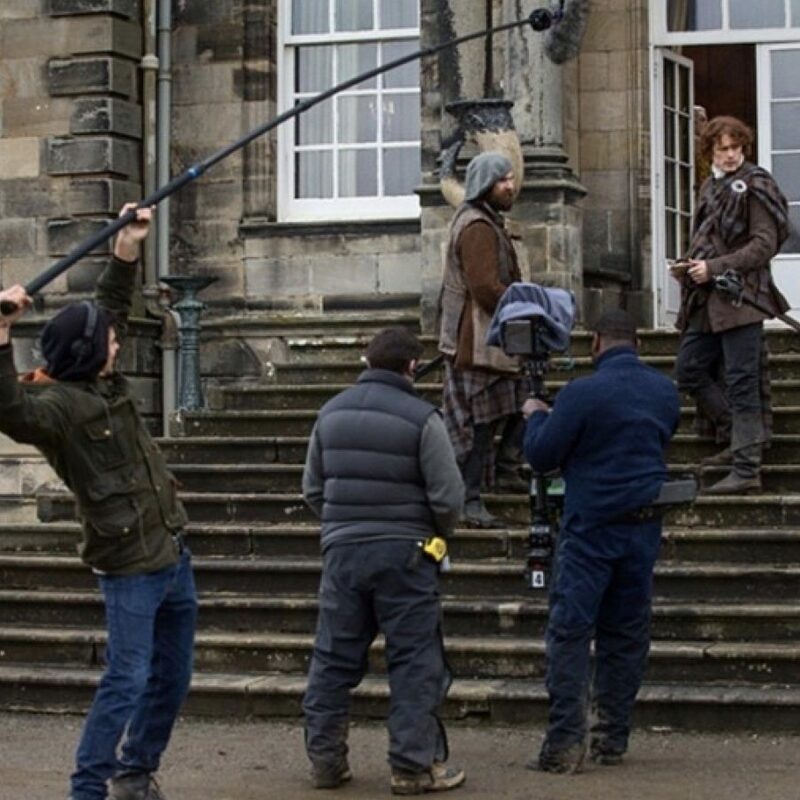 Hopetoun House has been used in seasons 1, 2 and 3 of Outlander. 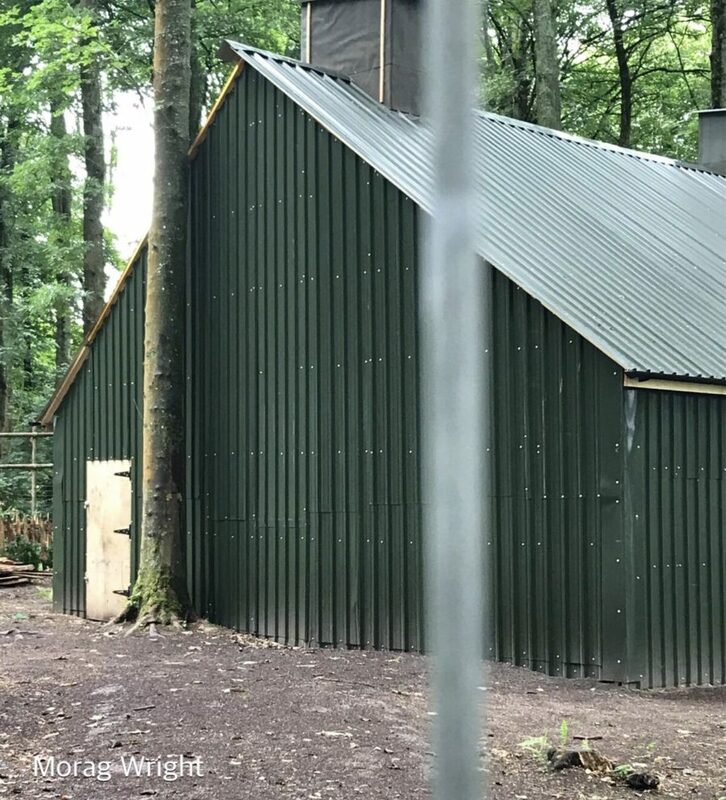 The temporary home of the Duke of Sandringham, Jamie’s swordfight with the MacDonalds on the lawn, the stables area of Helwater where Geneva propostioned/blackmailed Jamie, and various outdoor scenes have been shot on the grounds. 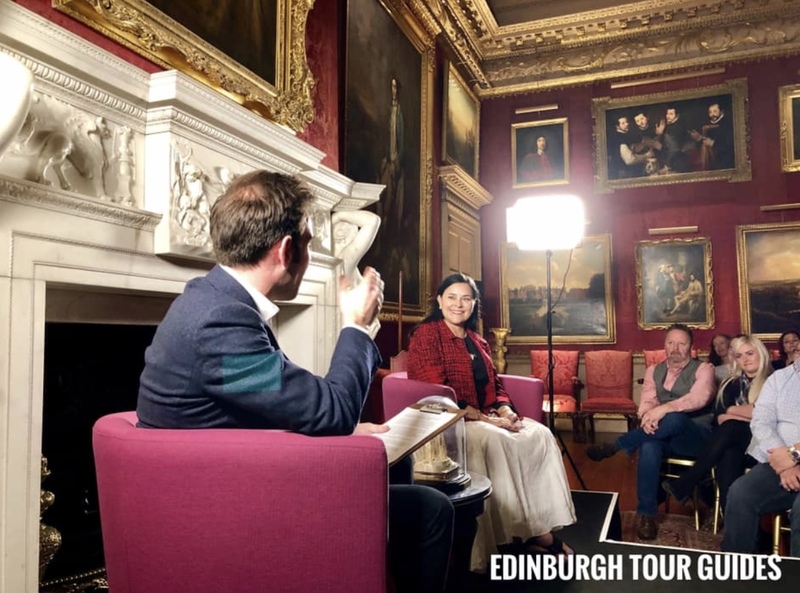 The evening with Diana Gabaldon was hosted by James Crawford, broadcaster and chair of Publishing Scotland. 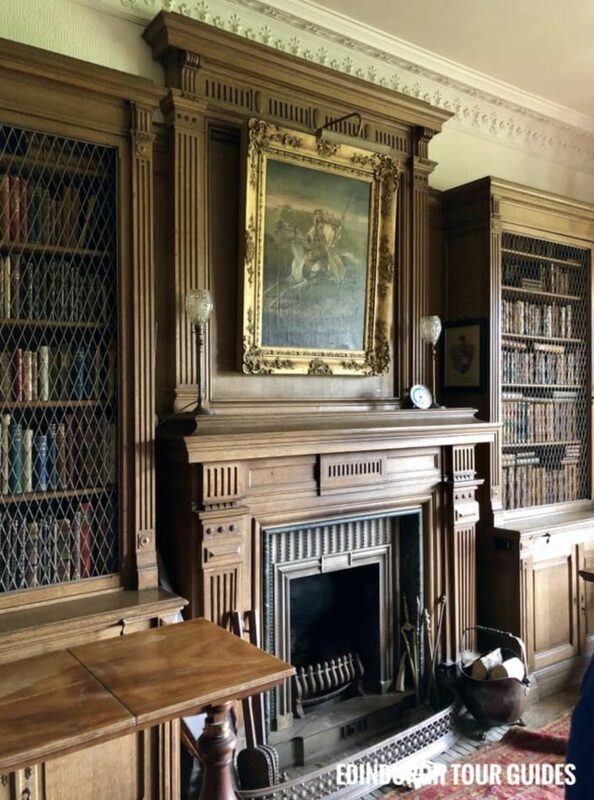 The event was held in the very room where Claire, Jamie and Murtagh had their conversations/confrontations with the Duke of Sandringham. 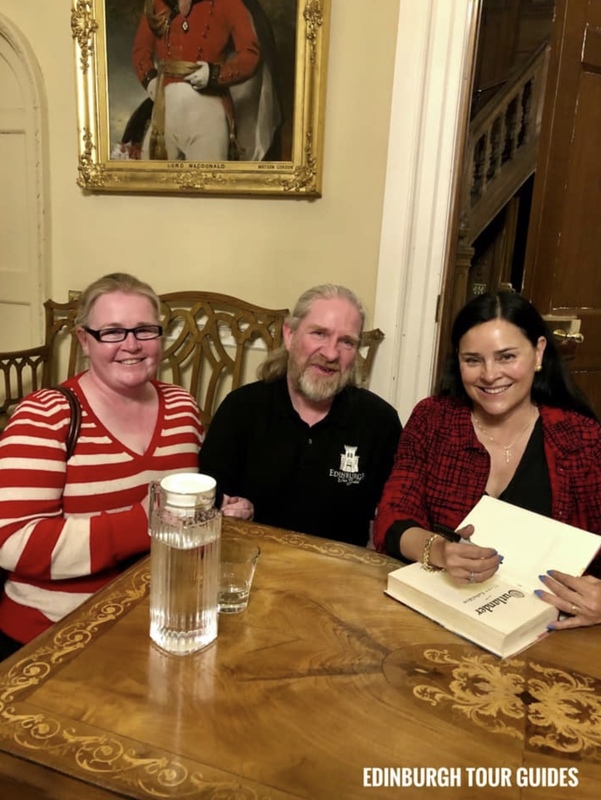 Angela Gourlay of Parkhead House and Sam Thomson of Edinburgh Tour Guides snapped up their tickets (which sold like the proverbial hotcakes) early, and here they are meeting Diana Gabaldon with their respective husbands. Superfan Graham Malcolm was on the spot too, and snapped these videos of the event where, among other things, Diana shares a bit about where she’s up to with “The Bees” — squeee! That’s gonna help a lot with the woes of #Droughtlander. 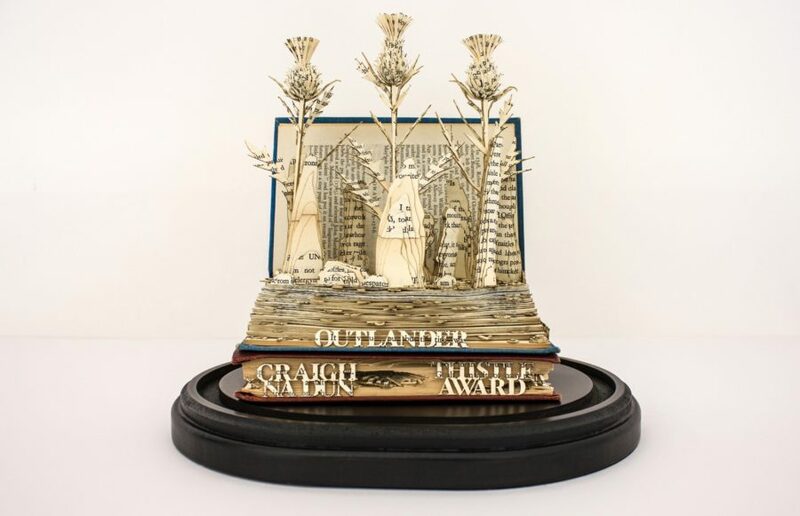 Graham and his twin bother Stewart are well known in the Outlander world for their tireless efforts to help fans get autographs and other Outlander memorabilia. 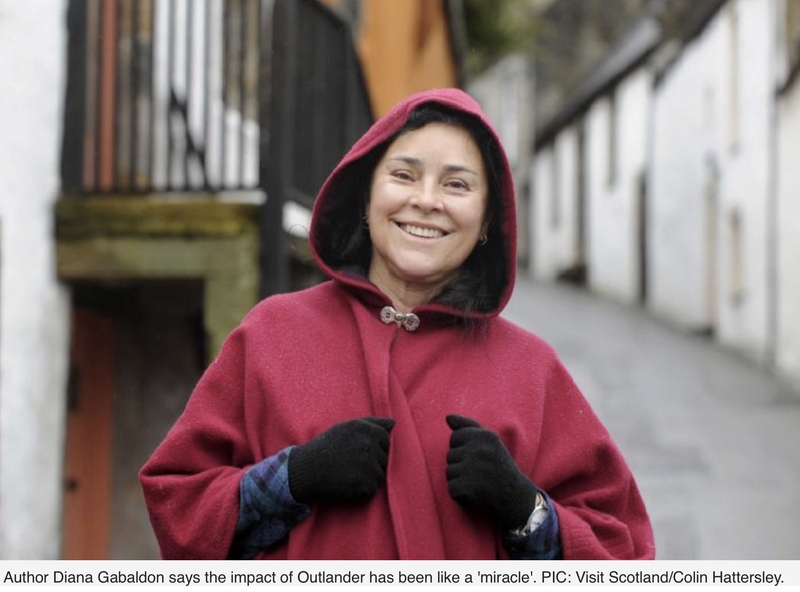 Such a well deserved award for Diana Gabaldon, who created this world which has us all hooked. 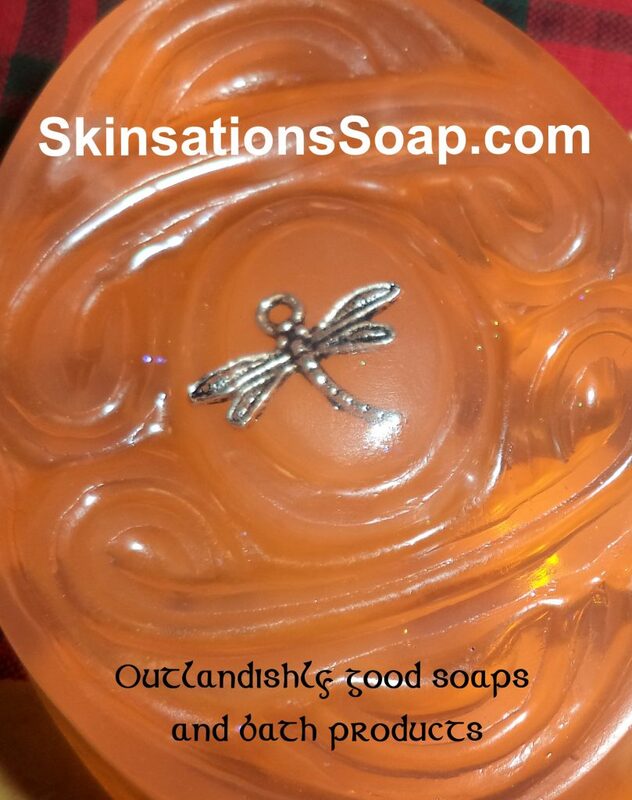 Put your hand up if you have been, or have a passionate burning desire (a la Jamie and Claire!) 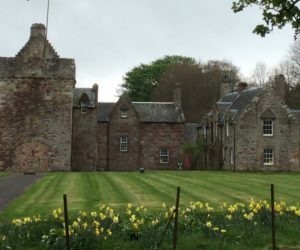 to get to Scotland, all because of the Outlander stories/show? What number is it on your bucket list? Scotland number one on my bucket list. I am a descendant of Lord Gearge Murray, and a few more clans on both sides of my family. Have been on the Outlander loop for 25 years. Love it all. Thank you, Diana. Been twice going again in 2020. Huge Outlander fan! I so enjoyed the Outlander saga so much. Yes, I know it is historical fiction but yet, I felt drawn to story, to the people, and of course to love story.? I am a Dillon. I am Irish.??? What possible connection could I have? Little did I know, as I watched the show, that in real life a small Irish brigade with commanding Dillons fought right along side the Scottish at Culloden. ?